According to the Treating Tobacco Use and Dependence: 2008 Update, a Clinical Practice Guideline issued by the U.S. Public Health Service, counseling and medication are effective when used by themselves for treating tobacco dependence, but the combination of counseling and medication is more effective than either alone. 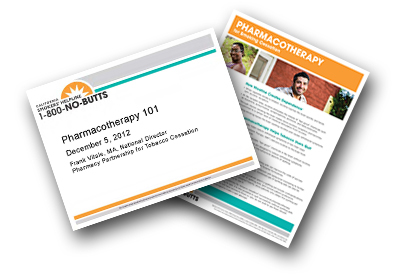 Improve your patients’ odds of quitting by requesting our Pharmacotherapy for Smoking Cessation Kit today! Request the Free Kit Now!